Small Retailers Prepare For Ban On Flavored Cigarettes Starting Tuesday, cigarette manufacturers and retailers will be banned from making or selling candy-, spice- and fruit-flavored cigarettes owing to a provision in the Tobacco Control Act. Many small-business owners worry about losing customers, while FDA officials see the move as a symbolic first step in addressing the problem of youth smokers. 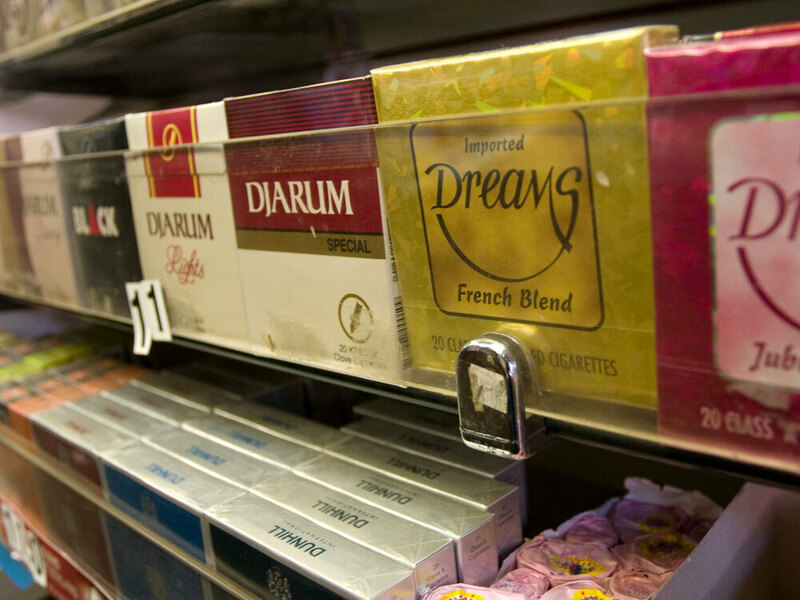 Starting Tuesday, cigarette manufacturers and retailers will no longer be allowed to sell flavored cigarettes, like these that line the shelf of a Brooklyn, N.Y., smoke shop. Starting Tuesday, cigarette manufacturers and retailers will be banned from making or selling candy-, spice- and fruit-flavored cigarettes owing to a provision in the new Tobacco Control Act. Public-health advocates are optimistic that the new federal law could help reduce smoking rates nationwide, especially among youth. But small-business owners — in particular, proprietors of cigarette shops — are frustrated about having to abide by another regulation. At Smoke Scene convenience store in midtown Manhattan, manager Ali Hassan pulls down some packages of flavored cigarettes. They're all products he will no longer be allowed to sell after midnight. "They come in cherry, chocolate, vanilla flavor," Hassan says. "The cloves come in cherry, chocolate, vanilla, 10 different types of cloves." For the past couple weeks, Hassan has been telling his customers the news. "Most of the smokers don't know about it, so I more likely have to tell them that it'll be banned on the 22nd," he says. "I had a couple customers that, you know, bought a lot. Some of the others, they decided that it's time for them to quit." Mini-Cigars: The Replacement For Banned Cigarettes? Since the Tobacco Control Act passed in June, some manufacturers have acted fast to try to retain their customers. One strategy is to promote new products such as the flavored mini-cigars on the shelf behind Hassan's counter. Cigarettes taste horrible. These do not taste as horrible. They just don't. "They're little cigars," Hassan says. "It will be the replacement to the cigarettes, clove cigarettes. It's a new product that just came out." The mini-cigars are packaged almost identically to the clove cigarette packs, only smaller. One store was giving away single smokes from free sample packs a distributor sent. But the Food and Drug Administration will soon be reviewing the new products to decide whether they are subject to the flavor ban. In the meantime, some of Hassan's customers, such as Dese'Rae Stage, will be difficult to convert. Stage has been smoking clove cigarettes since she was 15. "I like the smell of them," Stage says. "And once I started smoking when I got my friends to buy 'em for me, I liked the taste of them and that was that. I mean, cigarettes taste horrible. These do not taste as horrible. They just don't." But she doesn't feel the same way about the new clove mini-cigars, which she finds too harsh and irritating. So she says while she may buy a couple extra packs of the cigarettes before Tuesday, she's unlikely to switch to the cigars. "I'm in the minority," Stage says. "But I'll probably quit." Flavored cigarettes make up just a small percentage of convenience store sales and profits, but people who stop in for cigarettes may buy other items as well, like a drink or a snack. And in places like Manhattan, it's hard to see the flavor ban in a vacuum. Smoke shop manager Sami Mohammed says the flavor ban is just one of many local, state and national restrictions that are hurting his bottom line. "It's destroying us — it's rocking the smoke shops," he says. "It's killing us — banning all flavored cigarettes — as well the increase on taxes." One small relief for retailers is that menthol-flavored cigarettes are still legal — for now. But the FDA has called for independent study on how to best regulate them. FDA officials see the flavor ban as a symbolic first step in addressing the problem of youth smokers. "It's generally acknowledged that these types of flavors may be more attractive to kids and sort of help get them over the hump of the harshness of smoking until the addiction kicks in," says Joshua Sharfstein, FDA principal deputy commissioner. "So by taking away some of these fruity flavors, it will make cigarettes less appealing to the young." And there are more rules coming. The rest of the act's restrictions won't go into effect until at least next year.